at the intermot in cologne the young guns went out for a few drinks and met the management of indian motorcycles europe in a bar. after telling them what we do and who we are, both parties immediately knew that bringing our brands together would become a dope story. The project started with a stock indian scout that got delivered to our workshop. puuuh.... everyone who entered our shop and saw base, asked us if we`re crazy. 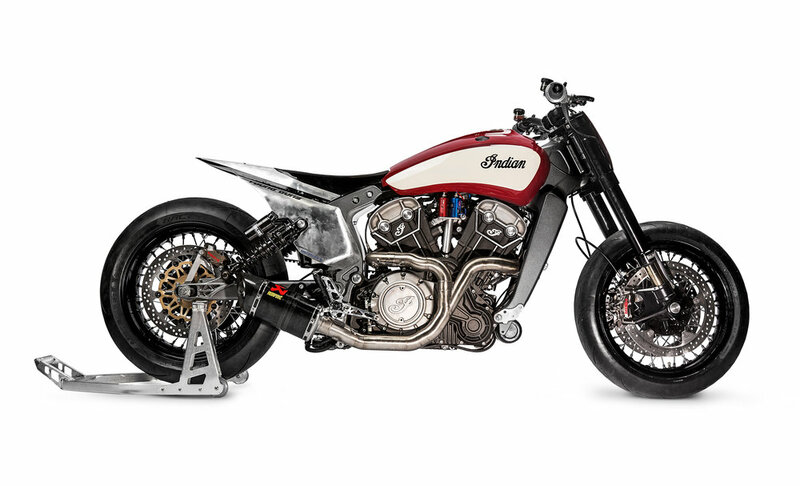 we must admit that it was pretty difficult to imagine the indian scout would be winning races against modern beemers and ducatis in just 4 month. the first step was to strip down the scout, just keeping the main frame, swingarm and engine. we quickly knew that we would place all the electronics unter a tank shell and relocate the gas tank as a structural part to the rear and also use it as subframe for the seat. for the design we knew that we`d like to build something contemporary. because if steve mcqueen would still be alive, he would not be riding a boring 60hp triumph bonneville frm the 60ies..... no he would be riding something modern and super fast. that`s why we wanted to add some modern supermoto style elements and also wanted the seat position to be upright and sportive. after finishing the tank that should still appear "scoutish" but had to be much smaller and turned out to be 13cm less wide than the original tank. luckily all the brands we got in touch were thrilled to support the project and hooked us up with the hottest and coolest parts available as : öhlins upside-down shock, brembo gp brakes, akrapovic exhaust, motogadget electrics, Lsl cnc parts, metzeler semi slicks and finally a fantastic nos wet system from the wizards of nos. there have been a few very difficult factors on the build. 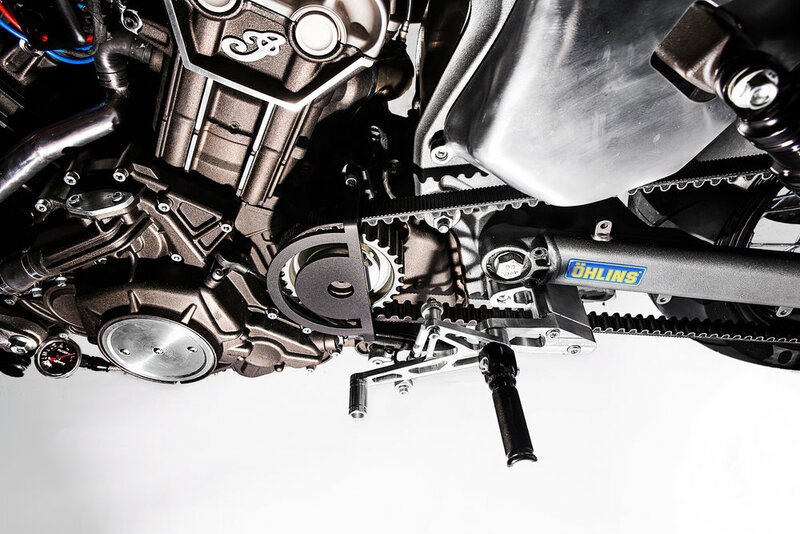 we had to machine triple clamps in collaboration with lsl to fit the special construction öhlins fork to the bike and finally place a bmw r90t front wheel. we have fabricated a cooler that is less than half of the size of the original one but is more than twice the thickness and made from alloy instead of steel. as the bike has a can-bus system the wiring has became a big challenge. we have made a new wiring loom including a qucikshifter, the nitrous injection and many relays. including about 60 cables. 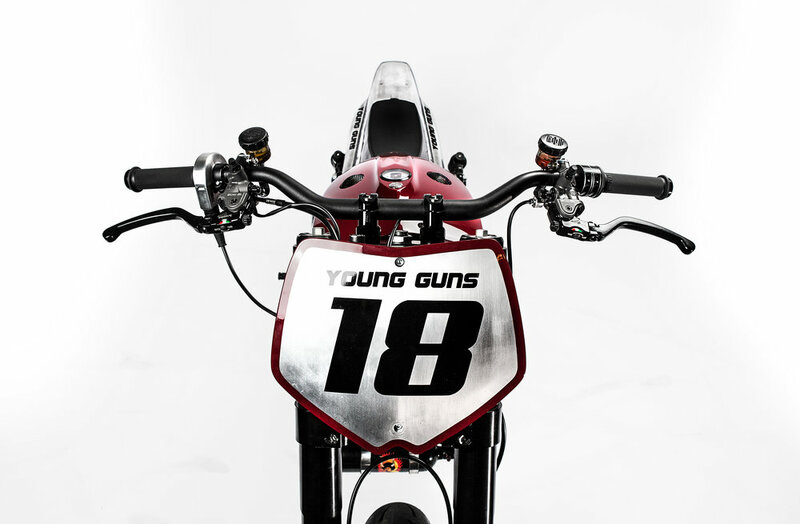 the rear part including the seat are heavily inspired by new supermoto bikes and has been fabricated in-house. because there are rear- sets available for the indian scout we have fabricated these in collaboration with lsl parts. the rear hub is stock indian scout but we have combined with a excel 18" supermoto rim. At the end we have gained 48kg of weight and added 90hp. when the bikes was finished we took it to the dyno of swiss auto, the guys who have developed the scout engine. after having issues with a slippery clutch it pushed 186.8 Hp on the power bench. the race season has been super successful for miracle mike. We have very clearly won 2 out of 3 races with katja poensgen riding it as a maniac. indian motorcycles, katja and the young guns have been an amazing team for the season 2017 !